I don't wanna use my head! I'm going for fearsome, but I think I'm just coming off as annoying. 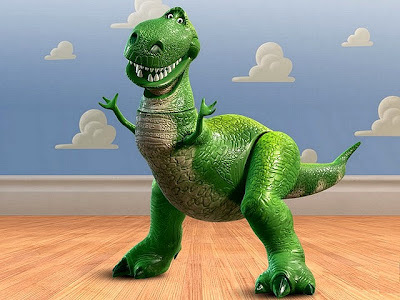 Okay, I have to admit my favorite dinosaur is Rex from Toy Story. I couldn't really tell you much else about dinosaurs, but I have a friend who could. Okay, so I've never met him, but we've emailed a couple times...His name is Greg Leitich Smith. He's super cool, and!, he happens to be a pretty good writer--and a published one at that! These two things (the good writer and published part) are a big reason why I'll be spending a week with him in June at the Writing and Illustrating for Young Readers conference. Greg will teach one of the two advanced morning workshop classes offered at the conference, and I'll be his lovely dinorsaur assistant. Greg, if you didn't already catch on, loves dinosaurs. And it just so happens that a couple of his books are about...welll, dinosaurs! If you don't know about WIFYR (the very awesome conference at which Greg-the-dinosaur-man will be mentoring and presenting), I'll tell you now that it is a very serious matter and that I will proabably dress up like a dinosaur. If you want to see this you'll have to join our awesome morning class--so send an email to staff@wifyr.com expressing your interest and explaining how you qualify as an advanced writer. This is the chance of a lifetime! Not just me in a dinosaur costume... I mean the chance to be in a small group worskshop led by Greg Leitich Smith! In Booklist, Louise Brueggemann noted that "Smith achieves just the right balance of intelligent wit and drama." 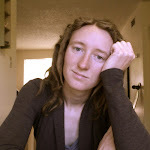 See you lovely writers at the conference!